Steve began studying the clarinet at the age of 10, first with Cyril Chapman (clarinetist with the Royal Philharmonia Orchestra) and later with Colin Courtney (clarinet professor at the Royal College of Music). He was a member of the Bromley Symphony Orchestra from ages 14 to 18 playing anything from Haydn and Mozart to Stravinsky and Shostakovich. At 16 he took up the saxophone with a pile of Charlie Parker 78’s as his main guide and inspiration. He completed an Earth Sciences degree at Leeds University before deciding to become a professional musician. He was a key member of Loose Tubes (the highly acclaimed 21 piece jazz orchestra that became the focal point of the British jazz renaissance of the 80s). During this time, he was closely associated with the London African and Latin American scenes, playing with bands such as Taxi Pata Pata (a top Zairean Soukous outfit) , Bosco D’Olivera’s Grupo Folia and Roberto Pla’s Latin Jazz Ensemble. His own projects included Orchestra Rafiki, co-led by long-time associate Chris Batchelor and featuring Kenyan Nyatiti player Ayub Ogada and Ghanaian drummer Nana Appiah, and also the Pigs Head Sons, another Buckley/Batchelor collaboration. 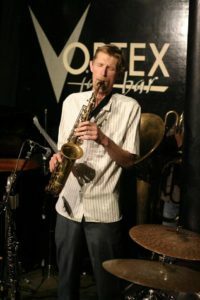 He toured and recorded with Ashley Slater’s Microgroove, Norman Cook’s Beats International and the contemporary classical ensemble Jeremy Peyton-Jones’ Regular Music. He has played and recorded with several Django Bates’ projects including The Third Policeman, Human Chain and Delightful Precipice. His continued connections with African music led him to travel to Ghana to work with The Pan African Orchestra and with Kakatsitsi in the UK. He has also played and recorded with Massukos from Mozambique. Steve’s main area of work has always been within the contemporary jazz scene, playing and recording with artists such as John Taylor, Julian Arguelles, Steve Arguelles, Eddie Parker, Iain Ballamy, Steve Noble, Billy Jenkins, Huw Warren, Christine Tobin, Phil Robson, Colin Towns, Seb Roachford, Mark Lockheart, Mike Outram, Joseph Jarman, Jonathan Joseph, Mark Sanders, Kit Downes and Leroy Jenkins. Steve’s close association with Chris Batchelor has continued with projects such as the internationally acclaimed Big Air, featuring Myra Melford, Jim Black and Oren Marshall. In 2006 Steve and Chris received the BBC Jazz on 3 award for best new work with “Ten Tall Tales”. More recently he has played and recorded with the legendary South African pianist Tete Mbambisa and also with the newly re-united Loose Tubes.